The Grass Tree (Xanthorrhoea latifolia) is a very slow growing plant that grows widely throughout eastern Australia. It can take more than twenty years for a trunk to appear, and then they normally grow at a rate of 1 to 2 cm per year. The two larger specimens here had 2m trunks taller than me, so I’m guessing they would probably predate European settlement in the area. I.e. they’re probably at least 200 years old. 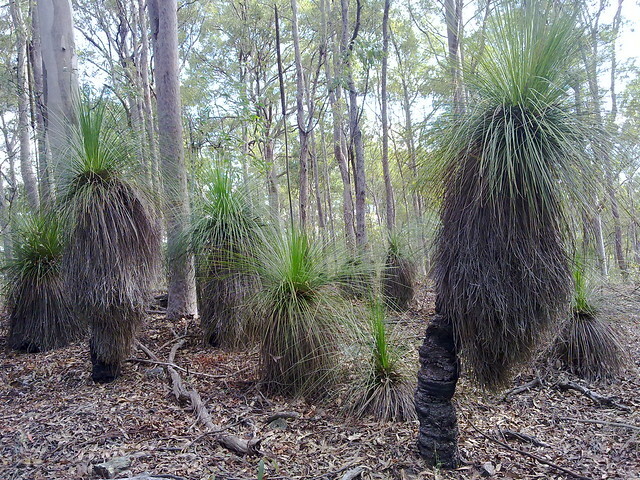 Aborigines used grass trees to make fishing spears. They also used resin from the plant as an adhesive and to mend leaking water containers. The trees provide a habitat for native insects and lizards. Some of the lakeside shores around here have forests of grass trees. When you think of how old some of these trees are, it’s an overwhelming sensation to stand among them.